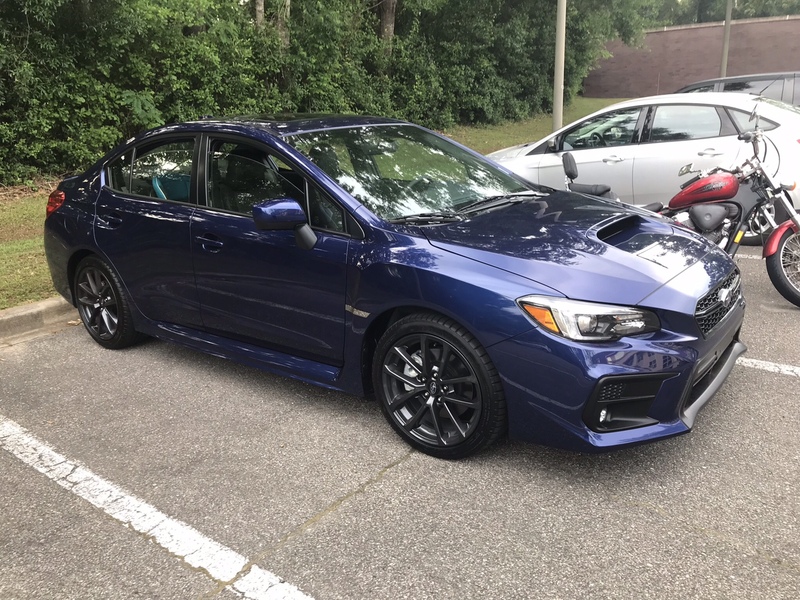 My local dealer has a new 18' Blue limited WRX with 40 miles for sale and i was considering getting it since they're offering about 6K off MSRP. When i looked at the date of manufacture, it's 10/17. I'm not sure when it hit the dealer's lot, but that makes the car about 18 months old and sitting for a while, probably has only had 1 tank of gas in that time. I've never owned a Subaru, so i don't know if there's anything specific about the boxer engine that would be particularly affected by sitting this long outside the usual tires, battery, and brakes. I just worry about seals and thing that aren't immediately noticeable. The car started right up, and i didnt really notice anything amiss driving it, but i know cars don't age well sitting and i don't want to buy an expensive car (to me) that ends up having problems because of it. Anything to worry about or ask to be remedied? I just want to make an informed decision about whether to pull the trigger on it. I would say the gas in the tank is the biggest worry, but if you cycle through with fresh gas it’s probably okay. At least you have warranty. Could have been hammered on some of those 40 miles.... max boost and load on a cold engine. I cringe every time a sales guy tells me "its OK, go ahead and hit it" on a test drive with a brand new vehicle with a cold engine - which I will not do. Makes me sure to only buy vehicles with 1 or 2 miles on the clock. Personally I would probably pass but at the least, if you buy you will want to be SURE that the odometer mileage on the paperwork is accurate. If you have some big problems down the road you don't recorded trips to max boost and redline at 20 miles being used against you in a warranty claim. That's true, but the ECU does engage engine limiter at lower RPM while cold so hopefully they did not abuse it. My sales guy who sold me my WRX last year said the same.. he says 'you're welcome to launch it hard and mash the brakes to see its limits!' I'm like I'm going to buy this car if I like it (had less than 10miles on the odo and I was the first customer to test drive it) so no thanks. I also coached him not to say those things to customers cause it does no good to cold engines. He should know better being in his mid-50's. Car has a warranty. Ask for new tires and drive it if you like it. A lot of cars sit on lots because they arent desirable for the market but also because some dealers wont let you test drive without commitment. I work at honda and at any given time we have 3-4 si’s sit on the lot. Thanks for the comments. I’m probably just going to go with a 19 limited because the current financing incentive makes the price pretty much the same. If they sweetened the deal with a free extended warranty to make me feel better about it sitting I’d consider it, but that’s not going to happen. ^I'm sure they would 'sweeten the deal' with an extended warranty to sell it because extended warranties are profit machines and cost nothing because nothing is actually covered in real life. Ask them and I bet they throw in some form of an extended warranty to sell it. Actually they are covered. My 08 WRX had its power steering rack and pump develop leaks and need replacing near 60k miles. I had the extended warranty, but thought that surely they'd not warranty the work. Nope, they did because though I was well past the original warranty (both in time and mileage), extended covered it. The cost of the extended warranty was about HALF of what parts and labor cost to fix the car. They had me in a loaner CX-5 (it was also a Mazda dealership. This was back in Spring 2013 shortly before I got the STI) for 15 days, partly b/c they had to wait for parts to arrive. Though they didn't cover the ToB going out on me 5 months earlier which cost me $1200 out of pocket. Thanks! Liking it a lot so far. Needs a full detail now.